Astrophysicist Neil deGrasse Tyson was named one of the 25 most influential people in space in the new book "New Frontiers of Space." Image uploaded on July 25, 2013. Thirty-four years after Carl Sagan brought the wonders of the universe into millions of living rooms, an epic follow-up to the long-revered "Cosmos" series is ready for launch. "Cosmos: A Spacetime Odyssey," hosted by famed astrophysicist Neil deGrasse Tyson, will premiere on Fox March 9 at 9 p.m. EST and the National Geographic Channel March 10 at 10 p.m. EST. Space.com: Why revive "Cosmos" now? Neil deGrasse Tyson: Any moment would have been good, but it's a matter of how many forces align to actually make it happen … It's not that it's now versus three years ago. It had to happen no matter what. Anywhere between 30 and 35 years is a typical length of what people think of as a generation. There's got to be at least one "Cosmos" a generation; otherwise, we're not doing justice to sharing with the public the role of science and bringing the universe down to Earth. Space.com: Can you give a few examples of the ways the science on "Cosmos" has been updated? Will the new series incorporate any discoveries of the past 34 years? Tyson: If you only think of "Cosmos" as a science documentary, then the natural obvious question would be, "Well, it's been 35 years. What has changed?" However, "Cosmos" wasn't only that, and it wasn't even mostly that. "Cosmos" is mostly "Why does science matter to you? Why should you care about science? Why should society care about what scientists say? How can you empower your own destiny by becoming scientifically literate?" So yeah, since then, we've discovered nearly 1,000 planets orbiting other stars, and Europa, one of Jupiter's moons has an ocean underneath it. There are other experiments that have gotten us closer to understanding the Big Bang. And, of course, the politics are different. Back then, we were steeped in a Cold War and using weapons that were imagined by scientists and used to hold the world hostage. So, the climate was different than it is now, but there are other prevailing concerns that we have: What is our effect on the environment? Will we be good shepherds of this Earth as we go forward? Do we know enough to be good shepherds of this Earth? Do we understand the risk of asteroids that could render us extinct? These are broad questions, and "Cosmos" takes some element of science and shows you why it is way more relevant to your life than you ever previously imagined. Space.com: Was there ever any conflict among you and the creators, Steve Soter and Ann Druyan, about what to add into the new series and what to preserve from the old one? Tyson: Well, there's always creative tension, and that's never a bad thing if people who are participants in the creative tension are intelligent and rational. Intelligent, rational people can disagree and figure out why they disagree, and maybe you go with one person's view or another person's view. Or, the disagreement leads to a third view that one or the other didn't have, and the third is better than both. So, all three of those scenarios would happen. Space.com: What was the most difficult part of making the reboot? Tyson: I have an unromantic answer for you there: It just took so much time. I got through it because it was all still novel to me. Everything was novel. Everything. Just watching the crew work. Now, I know what a "gaffer" is. You're going to see me alone standing, but what I see are the cameraman, the lighting directors, the supervisors, the production assistants, the associate producers, the director of photography, the director. That's what I see standing there, and that's just crazy. I didn't know I could have such a renewed respect for the collaboration that this trade requires. So, the hardest part was the many, many days in the studio and traveling on location — Iceland, Germany, Italy, France. And we recreated some scenes in areas of the world that would be turbulent, like Iraq, but there's some stuff that happened in Iraq a thousand years ago, so we want to talk about that. It's not going to stop us. Space.com: You make such a great tribute to Carl Sagan at the end of the first episode, when you talk about your first meeting with him during high school. How has this project been important for you personally? Tyson: I have a personal philosophy in life: If somebody else can do something that I'm doing, they should do it. And what I want to do is find things that would represent a unique contribution to the world — the contribution that only I, and my portfolio of talents, can make happen. Those are my priorities in life. I think if I try to do something that others do and leave out something that no one could do, then the world is not better off that way. And I felt that, given my early encounter with Carl Sagan, captured in this opening episode — the fact that I occupy a place on the landscape of science popularization — I felt I may be sort of uniquely qualified to follow in those footsteps in a way that matters most to the public. And, by the way, if I did not already have a following and life experience reaching for the public, if I were untested, there might be pressure for me to be like Carl Sagan. If I were forced to wear the shoes of Carl Sagan, I think I would fail at that, because he's Carl Sagan, and I'm not Carl Sagan. But I can be a really awesome version of myself. I can be myself exactly. And that's already sort of a tested entity, so I feel very comfortable in this role. Space.com: Did you meet Sagan any other time? Tyson: I'd say we only met like four times. The first time was very significant to me, as is obvious from that retelling. The last time is also significant. It was his 60th birthday bash. He would die two years later. It was a celebration, it was a dinner and there were all these testimonials. And you would sit there and listen to all these testimonials, and you would say, "My gosh, nobody could be that amazing." You know, old people, young people, middle-age people, colleagues, janitors were coming up, singing the praises of Carl Sagan. And then, after that, he gave a public talk, and it was the best public talk on any subject I had ever heard in my entire life. Not the best — the greatest. And I said, "Yep, he deserves every one of those accolades. Every one of them." Space.com: Where were you in your career then? Tyson: I was well established. I knew when I first met him that I wanted to study the universe. I was not one of the people who was turned on to the universe by him. His influence on me was recognizing that there is an appetite for a scientist who would sit down on the couch next to you and talk about the universe. That's what he did when you saw him on television. He's sitting right next to you. 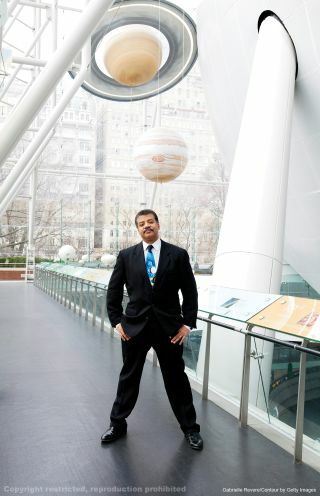 Not as a professor — he was a guy just trying to get you comfortable with the cosmos. The fact that that was possible, the fact that a scientist had talent to do that, the fact that people responded so warmly to it, told me that if I'm ever in the position to bring the universe down to Earth, that's a good place to start. Space.com: I wanted to bring up Bill Nye — I hear you guys are friends. Tyson: Yeah; in fact, I count him as my best friend. In modern times, he's my best friend. We text and email three or four times a week about one topic or another. We are sort of compatriots in this business, so we're always comparing notes and seeing how we could improve; we offer critiques — that sort of thing. There's professional value to the friendship that manifests. Space.com: What are your thoughts on the debate on evolution Nye recently had with creationist Ken Ham? Nye said he was doing it to raise awareness about science education in this country, and it seems like "Cosmos" might have similar aims. Tyson: There are different ways to do that. One of them is to legislate laws that will improve science teaching and the like. But think about all the ways your citizenry can be influenced. We all go to movies. We all watch television. And some movies are better than others, and some TV shows are better than others. What makes them better? Some are better filmed. Some are better written. Some are more compelling. Different people learn differently and react differently. So, "Cosmos" has the advantage of using a potent medium — television — combined with a portfolio of talent that has huge cinematic experience. Our director of photography is Bill Pope, who was director of photography for "The Matrix." So if you were director of photography for "The Matrix," you're thinking creatively about what the camera is going to do to participate in the scene … And so you combine all these factors in a script and in music and in my delivery and the camera movement, and you have a product that can influence the viewer not only intellectually, but ideally, if we succeed, emotionally and even spiritually —"spiritually" with a small "s," just that feeling you have that you can't assign words to, that feeling of awe and wonder. The debate as a medium is another way that people can get a sense of what views are and how strongly they hold up against views that would conflict with them. It is a vista on this huge landscape that reminds us that the struggle just continues — the struggle for science literacy. As I was watching the debate, I kind of felt like I and all my colleagues were in a castle looking out the small turrets, and he was out on the drawbridge fighting. And we're not aiding his battle — we're just sort of looking out the window, cheering him on from a distance. That's what it felt like, because he was there in the lion's den. Space.com: Speaking of science and religion, I thought it was interesting that Giordano Bruno's story was incorporated into the very first episode. [Bruno was burned at the stake in 1600 for espousing a heliocentric view of the solar system and claiming an infinite number of other worlds existed around other stars.] Can you tell me about that decision? Space.com: What was it like working with Seth MacFarlane? Tyson: He was primarily our broker — not a literal broker, but a figurative broker — who brought "Cosmos" to Fox, because he's a Fox entity, of course. And why would either we or Fox think that we are a good match for each other? We would not be Fox's first thought; Fox was not our first thought. It was Seth who put the two together, recognizing that Fox needed something like "Cosmos" and that it could put resources to bear on it. Seth has influence on many levels, one of which was the storytelling. The previous concept was people dressed in period costumes with British accents and glued-on mutton-chop sideburns. And people said, "No. Isn't there another way to do this?" And Seth suggested that we animate them — not in a cartoon way, but in a more graphic-novel, deep and brooding, suspenseful way, and that's exactly what came to pass. "Cosmos: A Spacetime Odyssey" premieres Sunday, March 9, on Fox and Monday, March 10, on the National Geographic Channel. Check local listings.